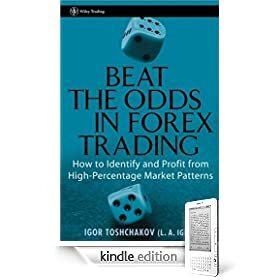 "Beat The Odds In Forex Training" is a book written by a skilled currency trainer named Igor Toschchakov who hopes to show you ways to beat the odds in Forex Training. He calls his system the Igrok Discrete-Systematic Method that is a system that is straightforward and teaches you to enter and exit the market according to a certain method. It helps eliminate the guesswork and hunches of when to make the right move. It walks you step by step through his system showing you such things as how to identify statistically significant trends and chart them so you have a better chance for success. He will also help you understand and profit from what Banks and financial institutions do as they can drive Forex prices and movements in the market. You will also be able to detect false trends as well and identify significant trends and chart these so you will have a much firmer grasp on the market and where it is headed. One of the biggest mistakes new traders make is over-thinking and this book will help you stay away from that. It is filled with many in-depth charts and expert advice and templates to see exactly what the Igor method is talking about. He shows you the steps you need to take and if you follow his method over time, you should do very well. This book has many good things going for it, but it does lack in several areas that you should also know about. First the book is not written in very good English and it does take some time to read and understand what he is talking about. He does explain everything well, but it will take you several readings to get his point. So be prepared when you purchase this book. The second drawback it his method is really nothing earth shattering that has not been presented somewhere else in many other books that have already been published. For the person who knows a little about Forex Trading you will not get a lot out of this book as it does not go in-depth enough. Beat The Odds In Forex Training has many great things going for it and it is a book that you will probably want to add to your collection. It shows you enough new things that you can try to improve your profit margin. Most people who have used the Igor Method have seen success and this book details the method and the ways you can implement it best to help you profit in Forex Training. Overall "Beat The Odds In Forex Trading" book is very good and worth the asking price. It does have some drawbacks, but for the most part it is a book that will help you understand Forex Trading and getting the most out of it.